Most big-name book stores like Chapters, Barnes & Nobel, or Books-a-Million will charge you 45% of your book price in order to have your book on their shelf for sale. If your book cost you $11 to have it printed (since you bought in bulk either from your self-pub printer or directly from your small-pub printer) and it’s listed at the suggested retail price of $20. You would be making $9 profit on every book sold – right? Consider this – your book is average size for your niche market but the average suggested price for your average sized book on the shelf is $16. If you list your book at $20 then you seriously need to ask yourself, “Why would someone spend $4 more on my book than his book of the same topic?” So you consider dropping the in store price and offering a discount on your book to make it more appealing and competitive. That still leaves you with a profit of $3 right? The reason the suggested retail price of your book is $20 in the first place means that your publisher/printer has taken into account that gouging from the big-bookstore and the $11 you make on the sale of your book literally pays for what you’re out of pocket. By lowering the price to $16 you would in fact be losing about $4 on the sale of every book. Freak out time? Maybe, maybe not. The more books you buy bulk from your supplier the lower the cost per book should be. If you’re able to get your costs down to less than $10 per book then you can consider lowering the retail price of your book. You will be on the higher end of your niche market, but with strategic marketing and contentious publicity you can still get your book into the hands of big-bookstore buyers… but you still won’t be making much, if any, profit. Either buy more books by bulk (if you have the money and the space to store them and you honestly believe they will sell like hotcakes) or consider your local Independent Bookstores as an alternative. 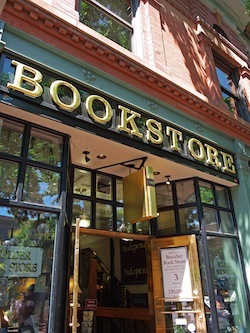 Most Indie bookstores charge around 30% for space and time on their shelves. That reduction of %15 give you, the author, a little more breathing room and a chance to make either more money or more sales depending on how you decide to price your book. Yes, getting your book on the shelves of bookstores could help your sales and get your work in front of those particular shoppers but you need to know what your motivations are ahead of time. it is certainly a balancing act. My aim was always to have my books available for order in bookshops and for sale in as many as possible. This worked to an extent but because Waterstones requested 60% discount, I ended up paying £1 for every book sold that way. (except at a book-signing when I took the books along and 50% was the rate and there were no distribution costs) For my current book I have been reluctant to even register it with Neilsons – but you end up cutting out a whole marketing opportunity. Tough choices. To reach more readers is it worth in effect paying them £1 to read my books in the hopes that next time…..What do you think? This is one of the toughest decisions you’ll have to make when deciding when and how to market yourself as an author. The answer to your question will be different for everyone. I did the same thing as you, Diana, and ended up paying about a dollar/book to have it sold via consignment in Chapters/Indigo here in Canada. What I have decided to do is set aside a certain number of print books for the big bookstores and look at the loss I’m taking as part of my marketing campaign – integrate it into my budget expenses. I am focusing more on small and Indie book stores where I can earn that dollar back and hopefully balance the books out by the end. I actually make $3-$4 when I sell the books myself at book events, local artisan events, and craft shows.